CAPE TOWN, South Africa -- BAE Systems has launched the newest version of its acclaimed RG series of mine resistant personnel carrier vehicle, the RG31 Mk6E, which will make its debut at the African Aerospace & Defence 2008 show in Cape Town (17-21 September). Since receiving a Canadian armed forces order for RG31 Mk3 vehicles in 2003, the Benoni-based company’s RG-series of products have boosted South African exports by more than ZAR3.5 billion ($430 million) with a steadily increasing series of additional orders for vehicles, spares and support from new customers around the globe. It has also created over 300 news jobs at its factory near Johannesburg and many more throughout its supplier network. “We are confident that this latest development, will further entrench our South African business as the world’s leader in mine protected vehicle technology,” said Johan Steyn, Managing Director of BAE Systems Land Systems South Africa. “The RG series builds on the three decades of experience we have gained in South Africa, through vehicles such as the Casspir, Mamba and Mfezi. Its success is a result of our ongoing investment into ever improving the vehicle’s protection levels. We achieve this by applying new concepts and designs influenced by customer and operator feedback and simulation,” he explained. New seats provide enhanced safety and protection. Among the latest developments incorporated in the RG31 Mk6E are new anti-mine seats. These provide enhanced protection to the occupants from lumbar spinal injuries which can be caused by the shock-waves associated with land mine detonations. The seats incorporate shock attenuation crushable elements developed by BAE Systems in South Africa. Tests have shown that these absorb some of the vertical impulse associated with mine blasts, reducing the likelihood of injury during large landmine explosions. The seats are mounted to the side of the vehicle in such a manner that they can move freely to enable the crushable elements to absorb the energy but without moving unnecessarily during normal operation. The seats are retrofittable to earlier variants of the RG series vehicles and are cheaper than earlier versions. The RG31 is a 4x4 mine protected vehicle with a V-shaped hull that protects the crew against anti piercing (AP) rifle fire, anti-tank mine detonations and a wide variety of Improvised Explosive Devices (IEDs). 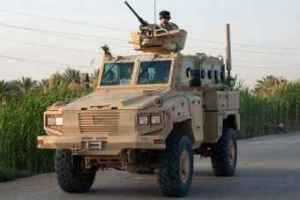 In standard Armoured Personnel Carrier configuration, this air-conditioned vehicle carries a driver and nine troops. Its modular interior allows it to be configured for use in many other tactical applications. Since 2004, BAE Systems has sold more than 2,200 RG31 vehicles, including a series of major orders for the US military -- which operates both the RG31 and its stable-mate, the RG33 -- in Afghanistan and Iraq. Of these, more than 1,300 RG31 mine-protected vehicles have been delivered to the US and Canadian forces. Another 984 RG31 Mk5E vehicles are currently on order with production underway at Benoni and partners in the US. The US RG31s are manufactured by BAE Systems in South Africa and under licence by General Dynamics Land Systems Canada. Similarly, the US RG33s are manufactured under licence by BAE Systems’ Ground Systems Division in the USA. The South African company earns royalties on each of its licence-built vehicles. In addition to ongoing US orders, several European countries are expressing interest in RG31 mine protected vehicle for their forces. BAE Systems is the premier global defence and aerospace company delivering a full range of products and services for air, land and naval forces, as well as advanced electronics, information technology solutions and customer support services. With approximately 100,000 employees worldwide, BAE Systems' sales exceeded US $31.4 billion in 2007.